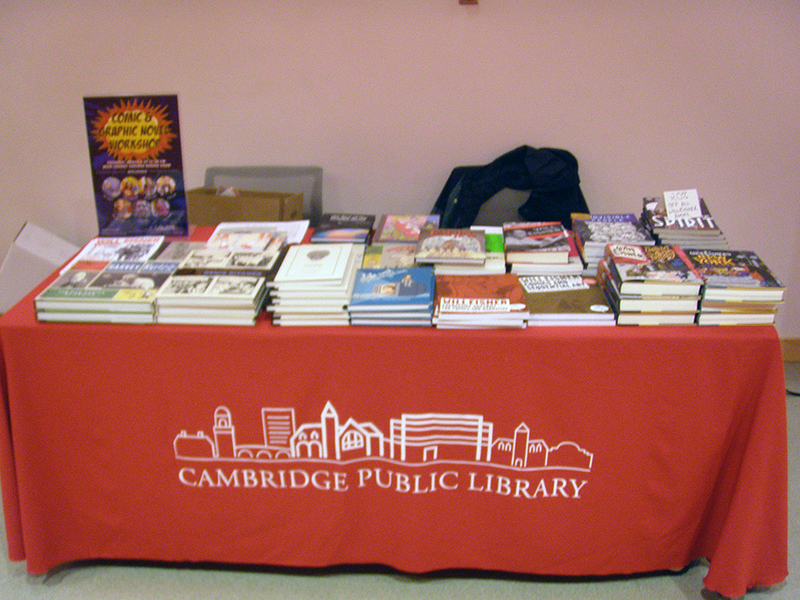 Last night, the Million Year Picnic and the Cambridge Public Library came together to run an event in celebration of Will Eisner Week. Since yesterday, 6 March 2014, was the 97th anniversary of Will Eisner’s birth, it seemed like a good day to start things off! First, we set up our sales table while waiting for our guest speakers to arrive. We brought a piles and piles of Will Eisner’s books (20% off!) as well as some of Denis Kitchen’s work and most of Paul Hornschemeier’s books. One final reminder that TOMORROW (Thursday, 3/6) is the official start of our Will Eisner Week events (including a sale of 20% off all Eisner-related books). It also happens to be the 97th anniversary of Eisner’s birthday. The start time for our evening event has been variously reported, but since it was in the BOSTON GLOBE as starting at 6:30pm, it will be starting at 6:30pm. At the invitation of Stephen Weiner, director of the Maynard Public Library in Maynard, MA, Harvard Square comic shop The Million Year Picnic will participate in Will Eisner Week 2014 as its Boston metro-area representative, hosting or co-hosting a series of events, notably two at the Cambridge Public Library. First, to honor the 97th anniversary of Will Eisner’s birth, there will be a Q&A session between cartoonist Paul Hornschemeier (author of MOTHER, COME HOME; THE THREE PARADOXES; the NEW YORK TIMES best seller LIFE WITH MR DANGEROUS; LET US BE PERFECTLY CLEAR; and ALL AND SUNDRY) and underground comics legend Denis Kitchen (cartoonist; author; founder and publisher of Kitchen Sink Press (1969-1999); founder of the Comic Book Legal Defense Fund; and Mr. Eisner’s friend, publisher, and agent for decades) at 6:30pm on Thursday, March 6th, 2014 at the Cambridge Public Library. Books by both authors will be available for purchase, and there will be a book signing after their presentation. In addition, on Saturday, March 8th from 12:30-2:30pm, the Cambridge Public Library will host a comic book workshop for kids with comics creators Jef Czekaj (author of HIP AND HOP, DON’T STOP! ; CAT SECRETS; THE CIRCULATORY STORY; and YES, YES, YAUL! ), Shelli Paroline (ADVENTURE TIME; MIDAS FLESH), Braden Lamb (ADVENTURE TIME; MIDAS FLESH), Dan Mazur (independent cartoonist, journalist, teacher, screenwriter and editor; co-founder of the Boston Comics Roundtable and MICE: the Massachusetts Independent Comics Expo), Bob Flynn (SPONGEBOB COMICS; GULP! a Monster Comics Anthology for Kids), Josh Dahl (RAPID CITY), and Dan Moynihan (whose work can be found in NICKELODEON Magazine and HEEBY JEEBY Comix). All seven creators will be signing at the Million Year Picnic from 3-5pm. At 4pm, they will be joined by Gregory Benton (HUMMINGBIRD, B+F), who will be signing from 4pm-6pm. Will Eisner Week features a series of events to be held early March 2014 in more than a dozen cities around the country to honor the work and career of the great comics innovator Will Eisner (1917-2005), the comics medium, and the graphic novel format. Finally, The Million Year Picnic comic shop at 99 MT Auburn ST, downstairs, Cambridge, Harvard Square, MA is running a sale of 20% off all Will Eisner books and graphic novels starting 10am Thursday, 3/6 and running through the close of business on Saturday, 3/8. For more information, please call The Million Year Picnic at 617-492-6763 and ask for Tony Davis (the owner) or Kelly J. Cooper (clerk & communications).